Advertiser.ie - Clarin College, Athenry celebrates its Golden Jubilee - 50 years! Clarin College, Athenry celebrates its Golden Jubilee - 50 years! 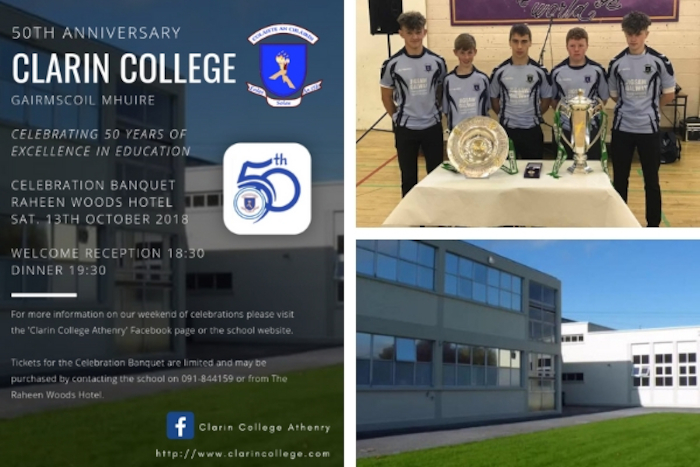 Clarin College, Athenry (formerly Athenry Vocational School ) will celebrate its golden jubilee on October 12th and 13th. The school first opened its doors to pupils in 1968 and, for the last fifty years, has given an excellent service in education to communities in Athenry and the surrounding parishes. In 2019, when the school community moves to a new 1000 pupil building, it will undoubtedly continue to build on this proud tradition. The changes that have taken place in society since 1968 have been monumental. The areas of science, communication and technology have undergone a revolution over those years. One of the greatest advances that we have made in this country has been in participation in education. The Vocational Education Act of 1930, which saw the creation of vocational schools, began this process and the introduction of free education in 1967 created a demand for school places that saw the opening of many new schools, one of which was Athenry Vocational School. The past fifty years have seen the school develop and grow. With a current enrolment of 600 students and a teaching staff of 55, Clarin College provides an excellent academic programme to Leaving Certificate higher level, as well as a range of Post- Leaving Certificate courses, including Animal Care/ Veterinary Assistant, Computerised Office Skills/ Medical Secretary, Administration, Retail Practice, Healthcare Support, Nursing Studies, Childcare Certificate in Early Childhood Care and Education (with Special Needs component )and Applied Social Studies, all of which are QQI (levels 5 and 6 ) accredited. During its fifty year history, the school has always excelled in sport, art, drama and music. The nineties were a glorious decade when Athenry Vocational School won three All-Ireland senior hurling titles in a row (1992-1994 ). Junior hurling and football titles were to follow in the following decade and the school’s junior camogie team was defeated by Roscrea in the All-Ireland Final last March. The golden jubilee celebrations begin on Friday, October 12th at 5pm with a hurling match on the school pitch featuring past and current students, followed by a Mass at 7pm in the school gymnasium to remember the deceased and living members of the school community. Light refreshments will be served afterwards. Visitors will also have the opportunity on Friday afternoon to view a display of old photographs and other exhibitions. Past pupil, Barry Cullinane, will be in attendance with the Galway Bay FM Baycaster. A souvenir booklet has been compiled to mark the occasion and will be available over the weekend. The celebrations will conclude on Saturday night with a Gala Banquet in the Raheen Woods Hotel, preceded by a mulled wine reception at 6.30pm. Tickets for the banquet are available from the school at (091 ) 844159. This is a wonderful occasion to meet, reminisce and to celebrate the contribution of parents, staff, students and the wider community to Athenry Vocational School. Page generated in 0.2032 seconds.